Home >> Generated from JAN's SOAR Information System on 4/21/2019 12:11:30 AM. Everest & Jennings introduces the latest in a long tradition of quality wheelchairs. The Advantage Recliner features performance and durability at an affordable price. 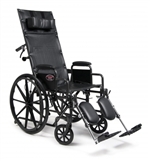 The full reclining back offers unlimited adjustment using easy brake and cable mechanisms. The Advantage Recliner comes with a higher back and removable full support headrest. The headrest includes an additional neck support that adjusts easily to fit every need. Anti-tippers and an anti-fold bar come standard. The durable hammer tone frame is designed to support up to 300 lb users. Available in 16", 18" and 20" seat widths, with 17" seat depth. Meets Medicare K0001 / E1226 (Recliner Back) / E0966 (Head Rest Extension) specifications for wheelchairs.